The teiids are the American equivalent of the European-Asian-African lacertas. Some members of the two groups are so similar superficially that it takes a specialist to tell the difference between them. Other members of the teiids, such as the very large species, do not have equivalents among the lacertids. 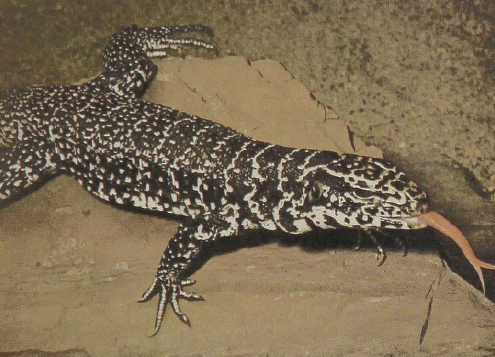 The Banded Tegu is perhaps the largest teiid. It occupies a very extensive range from the Cuianas across the lowlands of tropical South America to Argentina. Like most other large lizards, it supplements its diet of mammals, birds, and lizards with insects and worms as well as fruits and leaves. This lizard is much stouter and heavier than, for instance, the iguana; the 4y2-foot specimen collected by one biologist weighed about ten pounds. All this suggests that tegus are ground-living rather than arboreal. They can climb and do lay their eggs in the arboreal nests of tree termites. Not only do these termites quickly repair the opening into which the eggs have been laid, but the soldier termites presumably defend the nest against predators.